And for many, the results are nothing short of ruinous. Take Ante Grgas-Cice, 66. After a restaurant venture failed, he took out loans to go back to school, a decision he said "will haunt him for the rest of his life." Because he has had difficulty paying down his $30,000 debt burden, the government garnished his social security check for a period last year. “I put all my money to better myself," Mr. Grgas-Cice said, adding that he was cautious in his spending. He says it’s painful to think about his current conditions. But most Americans who find themselves in this predicament took out loans on behalf of their children. In recent years, Sallie Mae and Citizens Financial Group have been marketing "Parent Plus" loans to concerned parents who want to help out with their children's college education, but who don't have the money to pay outright. 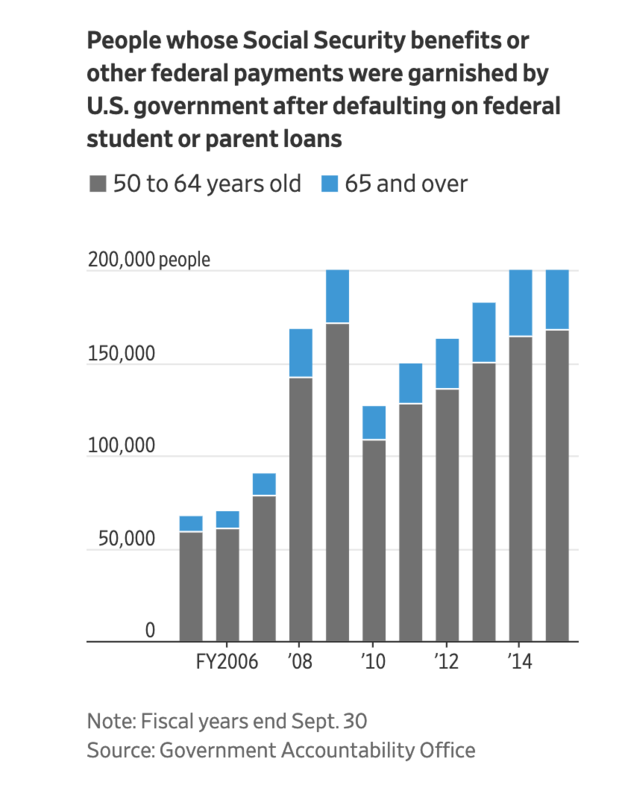 The upshot of these loans is that parents often get stuck with a tab they can't afford. An interesting loophole has contributed to this situation. 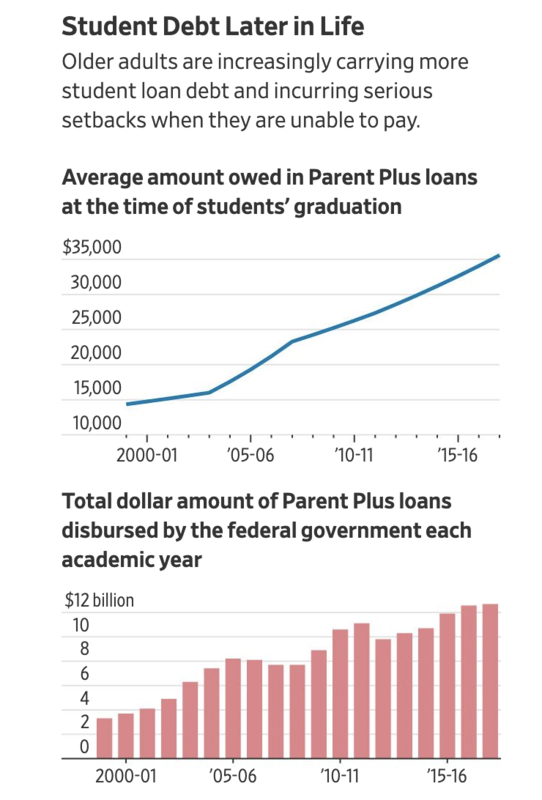 The federal government caps the amount that undergraduate students can borrow, but there's no limit on the money that can be borrowed by their parents. Hence, the "Parent Plus" loan, one of the most economically harmful consumer debt products of its time. 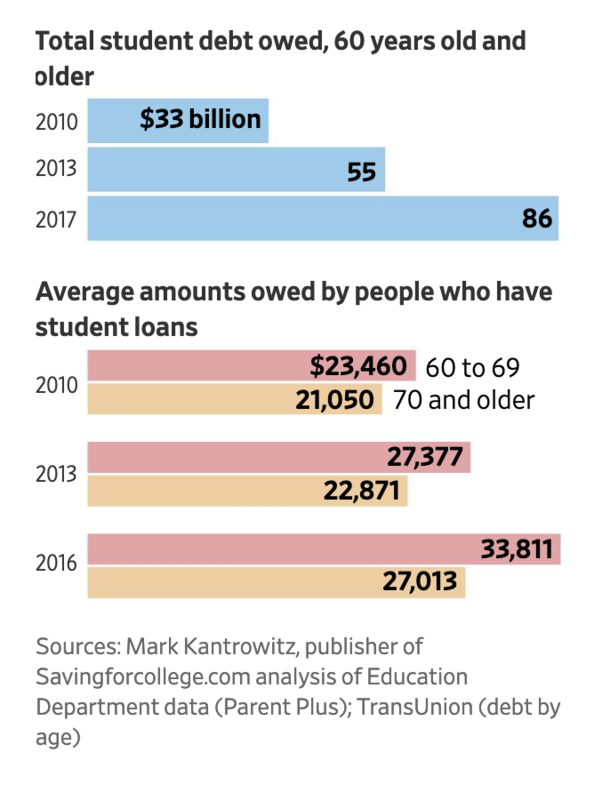 One parent who spoke with WSJ described how "Parent Plus" upended their retirement after he signed up for $136,000 in loans to pay for the education of his two children. 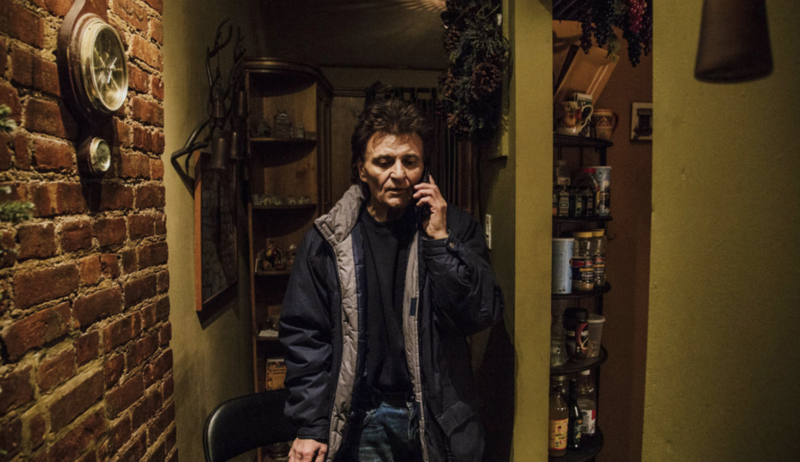 Each month, he and his ex-wife pay a combined $1,900. They believe they will be stuck paying off these loans into their 70s. "It’s a very dark cloud that’s always in the back of my mind," he said. Another parent described how payments toward his Parent Plus loans led him to rack up $40,000 in credit card debt. Living with this debt isn't only financially ruinous, he said. It impacts his ability to live a health life. The debt, he says, "affects your blood pressure, it affects your overall well-being," he said. "At this age you don’t expect to be in debt. It’s not where you want to be."